If adding zippers to your projects has always been intimidating, this is a great class for you! 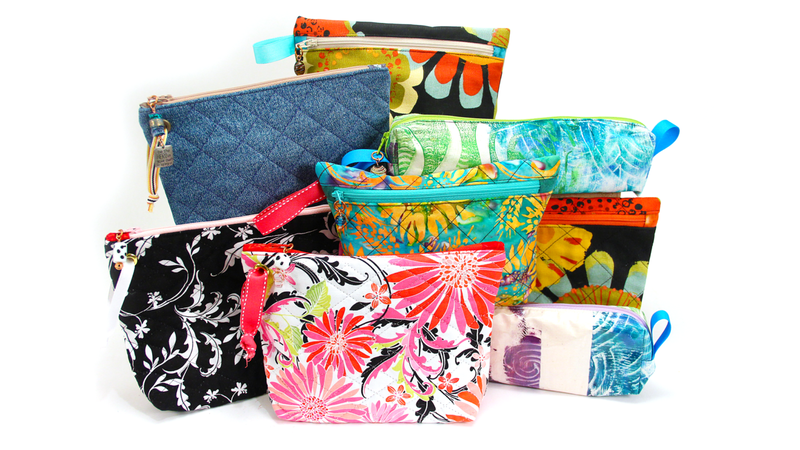 Learn how to sew zippers by machine and make adorable fabric pouches to hold your favorite supplies. Barb shows you step by step how to easily add zippers to your projects. It’s fun and creative and these pouches make great gifts, too. Did you ever wonder where the Zipper got its name? It definitely wasn’t the first choice for this interesting closure that made it’s first commercial success closing boots and tobacco pouches. Elias Howe, the inventor of the sewing machine, received a patent in 1851 for “Automatic, Continuous Clothing Closure” which he never tried to seriously market, thereby leaving the door open for other industrious people. You have to admit that the word Zipper is much easier to remember! Whitcomb Judson introduced the Clasp Locker (originally known as the “hookless fastener”) at the 1893 Chicago World’s Fair but it wasn’t exactly a rousing success. With more refinement zippers eventually became a closure of choice for clothing, tents luggage and other types of soft containers and in the 1930s, zippers were even featured in children’s clothing. When I began sewing, the most widely available zippers had metal teeth. If I were in a hurry to put on a garment straight from the clothes dryer, I created new dance moves as I tried to keep those hot zipper teeth away from my skin! Zippers improved significantly when plastic teeth replaced metal. I was taught by my mom and my home economics teacher to “press as you sew.” After melting a couple of plastic zippers, I learned to be careful during the pressing step. 😉 With the development of zipper teeth that didn’t melt as readily, following my mom’s advice was a lot easier. Sewing over plastic teeth was indeed less hazardous to my machine than sewing over metal zippers which were famous for breaking needles. Zippers are great for decorative as well as utilitarian purposes. As I was creating this class, I was reminded about the value of using extra long zippers. I’ll show you exactly what I mean and explain why, as I teach you how to make several adorable pouches with zipper closures. Be sure to download your class notes and I’ll see you in class!